The 119th Season of the Choirs begins on Sunday 8 September! The Combined Grace Church Choirs will begin their 119th season at the 11:00 a.m. Service on Sunday 8 September. Please keep the choristers, adult singers and staff in your prayers as the new season starts and we resume preparation and musical offerings in this exciting new season. 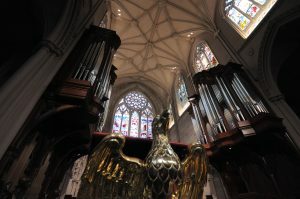 The Weekend Organ Meditation Series will begin on Sunday 8 September at 4:00 p.m. in the Church. Bach at Noon will begin the fall season on Tuesday 10 September at 12:20 p.m. in the Church. The Exhibition of the New Organ by our friends will take place at 3:00 p.m. in the Church on Saturday 21 September.